I recently saw a 14 year old girl in my office with a 2 day history of severe abdominal cramps, bloody diarrhea, and fever. Her mother had similar symptoms as did several other members of her household and some family friends. After considerable discomfort, everyone recovered within a few days. The child’s stool culture grew a bacterium called Campylobacter. 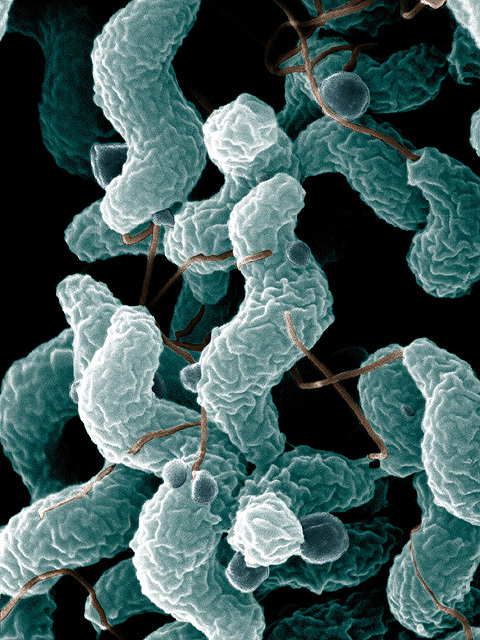 Campylobacter is a nasty little pathogen which causes illness like that seen in my patient, but can also cause more severe disease. It is found commonly in both wild and domestic animals. But where did all these friends and family members get their campylobacter infections? Why, from their friendly farmer, of course! My patient’s family and friends had taken a weekend pilgrimage to a family-run farm in Buck’s County, Pennsylvania. They saw farm animals and a working farm. And they all drank raw milk. Why raw milk? Because, as they were told and led to believe, raw milk is better. Better tasting and better for you. In 1862, the french chemist Louis Pasteur discovered that heating wine to just below its boiling point could prevent spoilage. Now this process (known as pasteurization) is used to reduce the number of dangerous infectious organisms in many products, prolonging shelf life and preventing serious illness and death. But a growing trend toward more natural foods and eating habits has led to an interest in unpasteurized foods such as milk and cheese. In addition to superior taste, many claim that raw milk products provide health benefits not found in the adulterated versions. Claims made about the “good bacteria” (like Lactobacillus) conquering the “bad” bacteria (like Campylobacter, Salmonella, and E. coli) in raw milk are pure fantasy. Some even claim that the drinking of mass-produced, pasteurized milk has resulted in an increase in allergies, heart disease, cancer, and a variety of other diseases. Again, this lacks any scientific crediblity. With this growing interest in unpasteurized dairy products has come an increase in the rate of food-born infections. The federal government developed the Grade ‘A’ Pasteurized Milk Ordinance in 1924, providing a set of guidelines for the safe processing and handling of milk products. Although all 50 states have voluntarily adopted these guidelines, the FDA has no oversight jurisdiction. It is up to individual states to determine their own safety protocols and enforcement strategies. While selling raw milk is currently illegal in 26 states, those with a will have found a way to skirt the law to get their fix of the real deal. My patient was a victim of a recent outbreak in Pennsylvania, but similar outbreaks of infectious disease due to unpasteurized milk products are a recurring headache for public health officials. Between 1973 and 1993 there was an average of 2.3 milk born disease outbreaks per year. That number increased to 5.2 per year between 1993 and 2006. Whatever the numbers are, there is no question that the increasing consumption of raw milk is a genuine threat to public health. The health claims made for raw milk, and against its pasteurized cousin, are being heavily pushed by a small but passionate contingent one might refer to as “food guardians.” These are people who espouse a return to the good old agrarian days of wholesome, farm-raised foods, free from man-made chemicals and mass-market processing. Some of these ideals are highly respectable and healthful responses to the ways in which society has dealt with the need to push products to a mass market at profit. For example, the use of pesticides, animal hormones and antibiotics, and farm run-off can have deleterious environmental and human health consequences. However, many of the health claims that are made about products like raw milk are not supported by scientific evidence, and lack scientific plausibility. Despite this lack of evidence, however, the allure of raw milk products is clearly on the rise. Beyond the obvious public health consequences of this trend lies the problem of an increasing public credulousness when it comes to pseudoscientific claims. This is similar to the trend we are seeing regarding concerns about the dangers of vaccines and excessive fears concerning certain potential environmental hazards. Unscientific and outright fraudulent claims about the health benefits (as well as the hidden dangers) of a variety of foods is on the rise. And bogus or unsupported nutrition claims are big business. From the immune boosting and weight loss powers of the acai berry, to the cancer protective effects of vitamins, nutrition pseudoscience is all the rage. While raw milk will never have quite the celebrity cache of these “super foods”, it is promoted with the same lofty yet empty claims, and provides the added bonus of infectious diarrhea. On a recent visit to a local high-end wine shop, I came face-to-face with the ease with which people fall prey to the marketing of food pseudoscience. A woman was examining a bottle of wine when the store keeper approached to offer help. She told her a little about the wine and then said, “And all of their wines are biodynamic.” To this, the shopper exclaimed “Oh wow, that’s great.” She bought the wine, likely without having a clue what the term “biodynamic” even means. Biodynamic farming is a mixture of Gaia-like principles (the earth is a living organism) and organic practices, with a smattering of mysticism, alchemy, and astrology. In essence, a smorgasbord of pseudoscientific farming practices perfect for the current culture of armchair environmentalism and the new found heal-thy-self mantra of the well-to-do. While the motivating factors and socioeconomic status may differ between those drinking biodynamic wine and those drinking raw milk, both are relying on false beliefs and unsupported claims in making their choices to consume these products. As a lover of cheese, I appreciate that there are those whose refined palates favor the delicacy of unpasteurized, aged cheeses so prevalent in other countries. But to stretch this taste preference to include health benefits unsupported by science and even common sense is not just misguided, it can be dangerous. Dangerous because it increases the risk of infectious disease, but also because it perpetuates a credulous perspective that adds to the ongoing erosion of our appreciation and acceptance of science.